Controlling graffiti is expensive, laborious and…hazardous. Most common graffiti removal products contain chemicals that can cause cancer, reproductive toxicity, or other ills. They are among the most dangerous cleaning products you are likely to use. Following a set of groundbreaking pilot tests conducted here in the City, the San Francisco Department of the Environment has posted a new set of safer, more effective graffiti control tools. The new resources go beyond chemical products to review graffiti preventive coatings, blasting machines, and protective films. 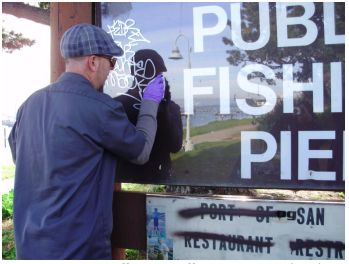 The Institute for Research and Technical Assistance completed its analysis of graffiti control options a few months ago, with the assistance of staff from the Port, Department of Public Works, Municipal Transit Agency, and Dept. of the Environment. The study concluded that the best approach for controlling graffiti depends on the surface: Masonry, metal, plastic, wood, or glass. The type of graffiti also makes a big difference: Ink pens, spray paints and adhesive stickers all require different approaches. When feasible, blasting systems are preferred for bare masonry or metal surfaces, and painting over is preferred for painted surfaces. For other situations, a variety of products are available, included some home-mixed products. View tools by surface type.